In a pan add butter cinnamon, cloves, cardamom, turmeric powder, onion, ginger garlic paste, chopped green chillies. Once the tomatoes are done, add cashew, pumpkin & poppy seeds. Roast for 2 mins then add some water to it then let it cool. Then grind into paste. 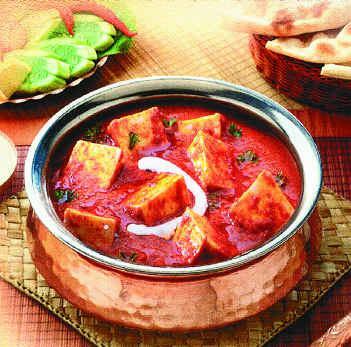 Chop paneer into 1" cubes then in another pan deep fry them. Remove excess oil on kitchen towel. Hi, I am very glad that u have given a very great recipe. It really tasted very good. all my guest members liked it very much. Where Can I have some of your receipes. Hi Yogi thank u for that ........Will write in more recipes further. Hi yogi I have written few other recipes here but its still not being published on the website so u must be getting it very shortly i believe so. Prathima, I must say I am so glad I came across your recipe. I tried it and this is THE BEST Butter Masala that I have ever tasted in my life. I only made one modification and added boneless chicken instead of paneer. But the gravy taste was awesome. Keep it up! Just fantastic!!! Where do I get more of your recipes. I am hooked onto your cooking already :-). Thank you Stephanie.I would help you with the ingredients that you would want to know in any other language so give me the ingredients name for which i can give other names which are easier for you to buy from the grocery stores. suggest some simple receipe to make panner butter masala. I am trying to learn Indian cooking as it is delicious - It would be wonderful to have a glossary of ingredients on this site so that it is possible to know what to buy at the grocers. The directions are very clear and for that I thank you. How wonderful this internet is - to be able to get original recipes from all over the world!